give your cat a box that's always clean and keep your home smelling fresh. No scooping needed! 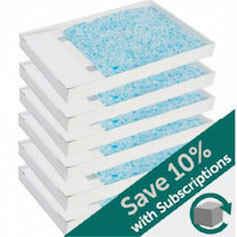 10% off ScoopFree litter box, lavender litter trays, & meal-dispensing cat toy. Shop now. Stop worrying about when you last cleaned the litter box and start enjoying more quality time with your cat. Odor control - Silica crystals absorb liquid and bacteria on contact for long-lasting odor control and moisture reduction. Fast drying - Odor-causing bacteria thrive in wet, humid environments. Drier environments are less prone to bacteria, resulting in less smell. Low dust - Cats and humans can develop respiratory infections from dust exposure. 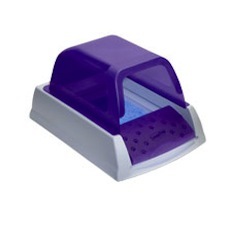 ScoopFree crystals are 99% dust free, giving you and your pet cleaner air. Easy to use - Throw the disposable litter trays away. No scooping needed! Texture your cats will love - Smaller granular litter is softer on your cat's paws. Non-tracking - Silica is less prone than clay to stick to your cat's paws. Whisper quiet - You won't even notice the litter box is in your home, and your cat won't get scared by any noises the box makes. Clean box every time - The motorized rake automatically sweeps waste into the covered trap, giving your cat a clean box every time. Lift the box and slide in a disposable litter tray. 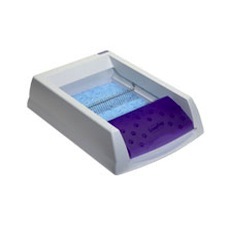 The trays are filled with crystal litter that reduces odor 5x better than traditional litter. No scooping needed! ScoopFree automatically rakes waste into the covered trap, so you can leave it alone for weeks at a time. Every few weeks, throw away the old tray and replace it with a new one. 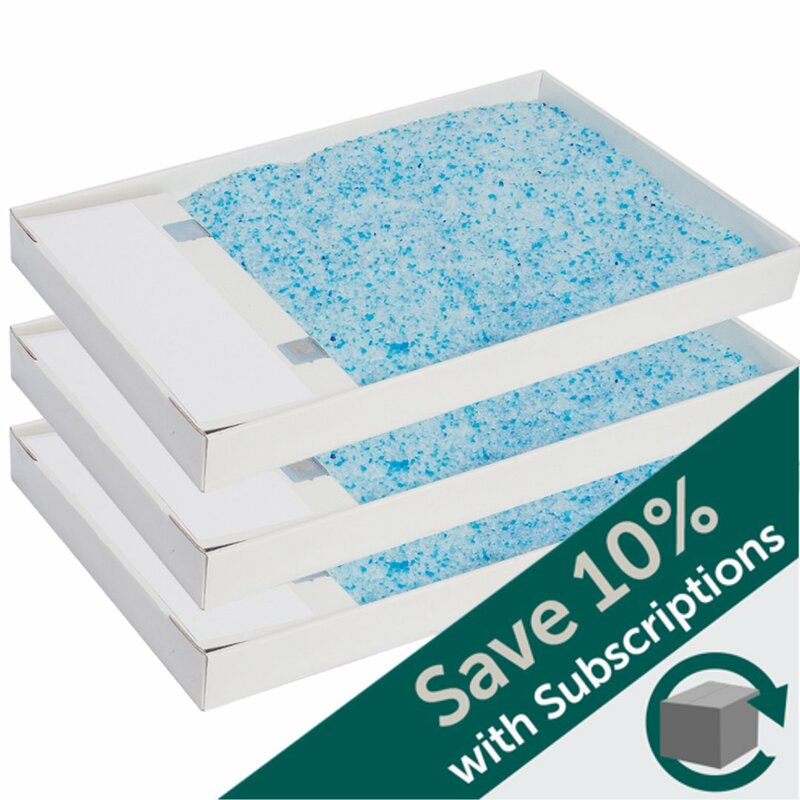 Get new trays automatically with the new autoship subscription service. My ScoopFree® Automatic Litter Box arrived today. I can't believe the difference in my home already -- no litter box smell, no litter tracked all over the place...... I love it! I wish I had known about this earlier. I previously (for the last 7 years!) 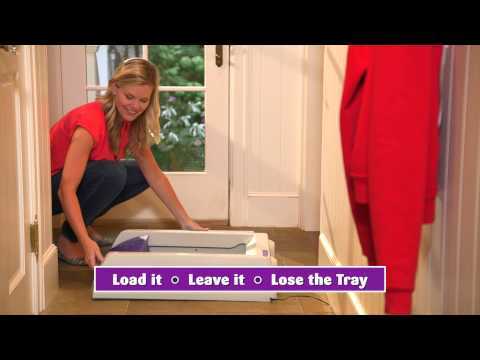 had a LitterMaid® Automatic Litter Box and there is absolutely no comparison. I threw the LitterMaid® in the trash today and didn't look back!! I bought this product a few weeks ago and LOVE IT! It is the best thing ever invented! I was amazed that after 2 weeks with 2 cats that that was the first time I needed to change the box! The cats love it, it's quiet and very effective! HIGHLY RECOMMEND!!! Spend the money, it's worth it! My Name is Fendi and I am a Blue point. My brother is a Seal point! We live in a high rise in Chicago looking over Monroe Harbor and Buckingham fountain. Our Condo is rather small and our mom is an extreme 'neat freak'! She wants our home to smell like fresh flowers!!! This wouldn't be possible with any other litter box. The thought of the smell of cats would have sent us packing. Thank goodness for your ScoopFree® litter box with no odor! We are getting along great! Mom brags about the ScoopFree® to everyone who visits! I just wanted to say 'THANK YOU'!! Nobody can truly understand the magic of this machine unless they use one. I have 2 cats, and with working full time and going to school full time I was afraid I'd have to give them up because I didn't have time to clean the box. But thanks to ScoopFree® I can keep my babies with my hectic schedule. I absolutely love this machine and all the things it has allowed me to keep! !